Brig. Gen. James R. Camp, Ohio assistant adjutant general for Air, was promoted to the rank of brigadier general during a ceremony Jan. 9, 2019, at the Maj. Gen. Robert S. Beightler Armory in Columbus, Ohio. The Ohio National Guard promoted Col. James R. Camp, the Ohio assistant adjutant general for Air, to the rank of brigadier general during a promotion ceremony at the Maj. Gen. Robert S. Beightler Armory. 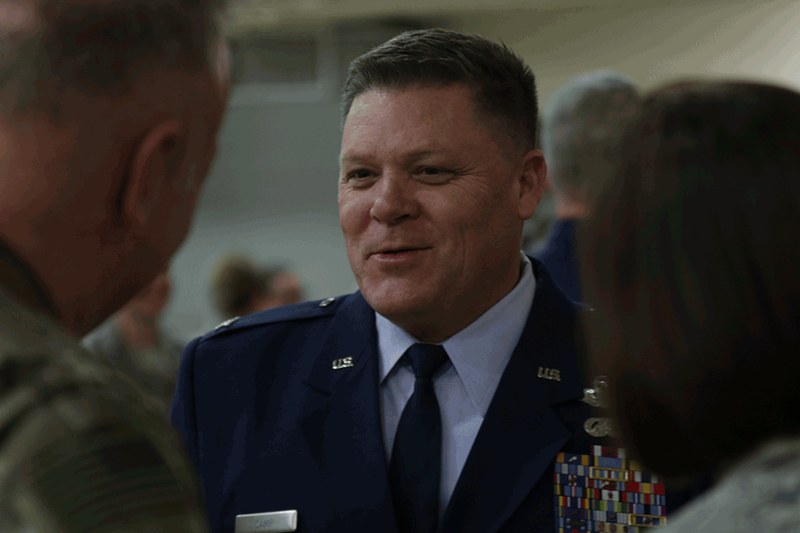 “The promotion for me is about my renewed commitment and responsibility to the Ohio National Guard,” Camp said at a gathering of over a hundred current and retired military personnel, Family and friends. Maj. Gen. Mark E. Bartman, Ohio adjutant general and commander of the Ohio National Guard, served as the presiding official at the ceremony, which was carried out in accordance with military tradition: playing of the national anthem, invocation, promotion order, pinning of insignia, oath of office and posting of personal colors. “We’re all excited to promote (Camp), who has a unique family history in regard to military service, to general officer and look forward to his future work,” Bartman said. Throughout his military career, Camp has stepped out of his comfort zone and volunteered for nontraditional roles, including special operations assignments, Bartman said. He has deployed in support of numerous operations including Noble Eagle, Iraqi Freedom and Enduring Freedom. He is a command pilot with more than 4,000 hours of military flight time. Camp has also served in a number of operational and staff positions throughout his career to include the Ohio National Guard director of human resources, 745th Special Operations Squadron (Provisional) commander, and coordinator and tanker control duty officer with the 618th Tanker Airlift Control Center. Watching Airmen work is what motivates Camp, he said. “I am inspired to put my boots on, especially when I have time to go out and spend time with our Airmen, whether it’s deployed, in a training environment or simply going out to visit a wing,” Camp said. Camp is responsible for directing Air National Guard operations and establishing policy to ensure mission readiness of more than 5,100 personnel assigned to four flying wings and six geographically separated support units. Brig. 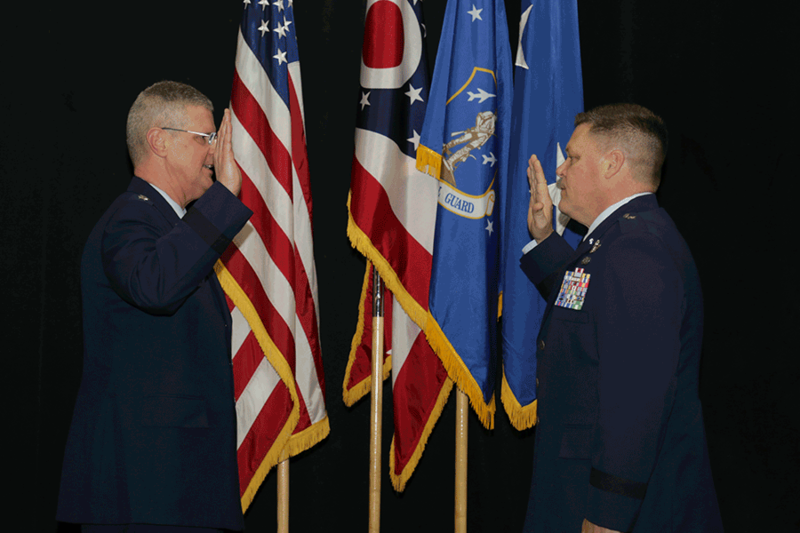 Gen. James R. Camp (right), Ohio assistant adjutant general for Air, takes the oath of office from Maj. Gen. Mark E. Bartman, Ohio adjutant general. Brig. 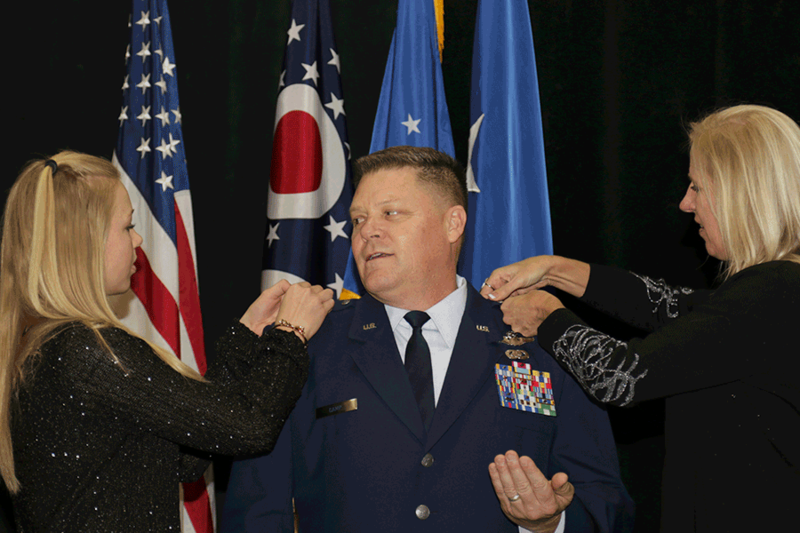 Gen. James R. Camp, Ohio assistant adjutant general for Air, has his one-star insignia pinned by his wife Cynthia (right) and his daughter Remy. Brig. 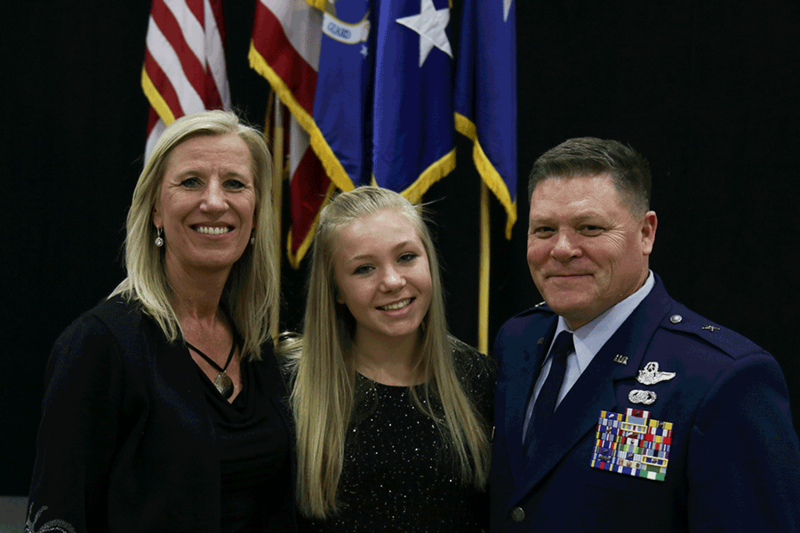 Gen. James R. Camp (right), Ohio assistant adjutant general for Air, celebrates his promotion with his wife Cynthia (left) and his daughter Remy. Brig. Gen. James R. Camp, Ohio assistant adjutant general for Air, talks with friends . After more than 36 years of service in the Ohio Air National Guard, including two years as the assistant adjutant general, Brig. Gen. Gregory N. Schnulo officially retired Oct. 1, 2017. He discusses his career and other topics in a video interview. Retired Brig. Gen. James M. Abraham, former Ohio assistant adjutant general for Army, died Nov. 8, 2015. He is credited with the creation of a college tuition grant program for National Guard members, now known as the Ohio National Guard Scholarship Program, which helps pay up to 100 percent of college tuition costs in exchange for military service.